I thought opening this thread for spoiler-free recommendation and discussions about TV-series which are today almost of a cinematic quality, sometimes even higher in terms of story and acting! since its not longer degrading for actors to play in television series! there is by far more DVD sold of TV-series than of movies! So I start by highly recommending Mad Men which I have started to watch! Truly TOP QUALITY television! A welcome new thread pourya jan. This way we can keep the Lost thread show specific. I've heard about this Mad Men series and its all been good things. From what i understand it's socially and historically analytical and that type of thing appeals to me if done in an entertaining and ambiguous way. Is it purely character driven? How many seasons are there so far? So far there have been two seasons showed and i am half way through first season. I can only verify the info you have got on the show, Pedram jan! It is mainly character driven, but many historical element and events of that era is brought up and discussed indirectly on the show! For instance the Kennedy election, or when Israel decided to hire Americans to market the country as a tourist destination! There is also an air of mysetry about the main character which is slowly unfolding on the show. Its is very well written and each episode is full of monologues/dialogs to be quoted! 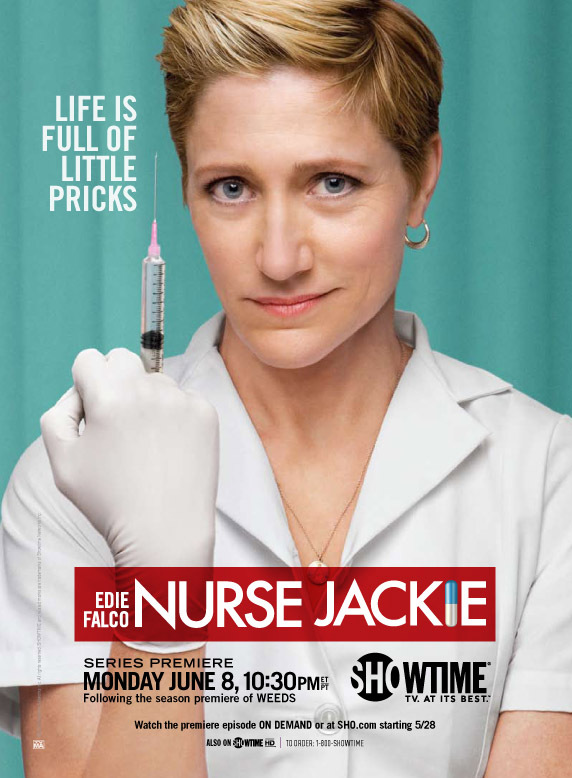 thx for info P jan .
Mrs Soprano back in new showtime series! have no idea what kind of plot it is, hope its not a generic doctor show but rather a darker concept like nip/tuck goes Dexter! PS. just found out its about a drug addicted nurse! brilliant! will be getting the blu set! Can't wait to start watching season 2 already! another series I have got for summer viewing is this showtime series which is praised by the critics. It was recommended to me by my friend, to whom I had recommended Brotherhood! I love vampires, hopefully the FX are well-done and not corny like Twilight! Wow, thats a nice Mad Men collectors set pourya jan. Is that the Blu-Ray version that you will get, or is that the DVD set you already have? That is the R1 DVD set Pedram jan! The blu-ray (I will henceforth refer to it as BD since its what collectors use) comes in a regular packaging. btw, all fans of Sopranos have a good reason to watch Mad Men! "Matthew Weiner wrote the pilot of Mad Men in 2000 as a spec script when he was working as a staff writer for Becker. Television producer David Chase recruited Weiner to work as a writer on his HBO series The Sopranos after reading the pilot script in 2002. "It was lively, and it had something new to say," Chase said. "Here was someone [Weiner] who had written a story about advertising in the 1960s, and was looking at recent American history through that prism." Weiner set the pilot script aside for the next seven years – during which time neither HBO nor Showtime expressed interest in the project—until The Sopranos was completing its final season and cable network AMC happened to be in the market for new programming. "The network was looking for distinction in launching its first original series," according to AMC Networks president Ed Carroll (Carroll misspoke: AMC's first original series was the comedy-drama "Remember WENN", which ran from 1996 to 1998) "and we took a bet that quality would win out over formulaic mass appeal." According to the first episode, the phrase "Mad Men" was a slang term coined in the 1950s by advertisers working on Madison Avenue to refer to themselves." Showtime seem to be quite prominent in US television at the moment even offering more new shows than HBO and Fox it seems. Are they a new network do you know? you mean if there are new networks? I actually caught the CRASH TV series from the newly launched Starz network months ago! that was also a great show! ell be renewed for a second season! the worst part with showtime is them being infamous for their cancellations! they have pulled the plug on far more shows than any other network! loooooool i said showtime AGIN while I mean HBO!!!!!!!!! I totally forgot all about that Crash TV, i remember reading your blog at the time and meaning to check it out, mainly due to that incredibly hot actress lol. I must get round to watching it at some point. I actually was referring to Showtime itself, whether it was a new network? I'd not come across many (if any) of its productions prior to Cali..
Talking of cancellations, i was utterly dismayed to hear that CBS has cancelled one of my favourite shows "The Unit". I'm hoping one of the other networks will pick it up. now Pedram jan, showtime is nothing new, however is has previously been associated with more documentary programs and theatrical plays than cutting edge TV series! It has all changed now! regarding the Unit, I don't think that I have ever caught any other network picking up a network's canceled shows! I don't think they even can, since its owned by the network and associated with it! so it wouldn't be a good investment! It looks bleak for The Unit then It has happened here a few times that soaps in particular have swapped networks. The most recent and notable being the Australian soap "Neighbours". I want to pick up on a comment you made earlier in this thread pourya. You hit the nail on the head when you described many TV productions superior to even motion pictures themselves. I think this has been a gradual development over the past 10 years. I can name show after show that have i have avidly followed these past years, but struggle to name many films that have appealed to me. yes, and you can see the change of attitude when it comes to starts as well! more and more turn to television for a more steady career and solid production! looool, Jim Robinson!!! :haha: It's amazing how he has managed to forge such a high profile in modern US television from such a late stage in his career. He has now appeared in Lost, X Files and Entourage to name a few. yes, but sadly as a typical case of typecasting! all the characters are similar! btw, sorry pedram jan I forgot to reply regarding the multi-region player! to be honest I hardly notice the difference! then again I'm not that sensitive! Hehe i'm overly observant when it comes to such details pourya jan. I don't know if you have invested in a BluRay player yet or not, but i highly recommend the PS3 as not only is it probably still the best player out there it offers great upscaling for std DVD too. i havent pedram jan, i am the kind of guy who watches movies in avi-format on his laptop! hehe, its both practical and conveninet. plus that i live a nomadic life with no place i can store a HD tv at the moment! you saw the condition!lol in a couple of years perhaps. i like it! i dont go out of my way to watch it though but when ever im free on wedensdays i watch it! as it aires then here. this would mark my first time looking for a download for it lol because some intense action happened in tonights episode and i just have to know what happens next lol.